Champions of Rome features the usual high end graphics from Yggdrasil, and it delivers a Coliseum-based slot where gladiators are the heroes. Champions of Rome has a story that isn’t exactly new, or even rare, for a slot machine. The gladiators have been the stars of a lot of different slot machines, but few have had the same level of design quality as this one does. Yggdrasil Gaming is capable of launching impressive looking slot machines, and it’s quite obvious in this case. You see the Coliseum’s stands and crowds in the background image, though your attention will most likely be on the slot’s reels. On them, you will discover several gladiators in armor, along with a Roman soldier, different shields and carved images representing lions, bulls or eagles. Marble columns support the game area to the sides, and a roof at the top has the Roman Eagle and the game logo. Overall, one of the best looking Roman themed slots that you will find anywhere, if not the top choice. The design might be extraordinary, but the game area you play on will be fairly common, with 5×3 reels and 20 fixed pay lines. As for its top jackpot, it appears capable of reaching a value of $120,000 (1,200x the stake), while the RTP is calculated at 96.4%. For its list of features, there are two types of free spins (Training and Deathmatch), three different Gladiator Features, the Buy Bonus option and wilds. 3 or more Free Spins icons will have the feature triggered, along with a reward of up to 600x the stake. You can play in Training mode, without risk, or you can choose Deathmatch (up to 4x multipliers, but if you don’t win 450 coins or more, you lose everything). You can also buy yourself access to the free spins, if you pay 1,000 coins. During free spins, you can get a Battle going, between the Beast and one of the Gladiators. If you get only 2 Free Spin scatters, then you trigger a Gladiator feature, one of three available (Swords with stacked or double wilds, Mace with 2×2 wilds and Trident with its 4 random regular wilds). The wilds you see here are regular ones, which substitute for regular symbols, nothing more. 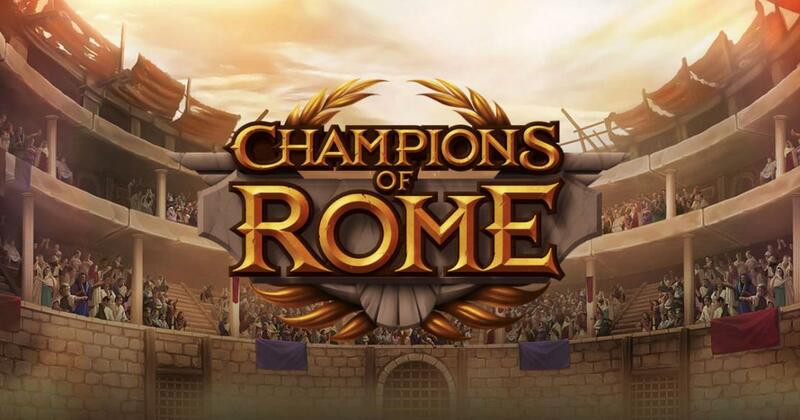 Champions of Rome looks like one of the more impressive slots from Yggdrasil, and definitely has one of the best designs for a Rome themed title. Try of out a demo version of Champions of Rome.